This guide has been designed to help you make better use of technology to manage the assessment and feedback process. It will help you improve academic practice and the business process that support this. Throughout the guide we use the term electronic management of assessment (EMA) frequently. 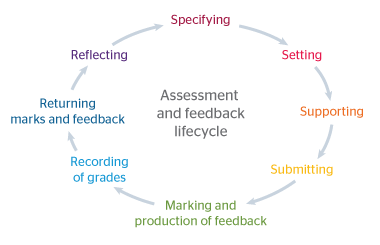 This describes the way technology can support the management of the entire life cycle of assessment and feedback activity, including the electronic submission of assignments, marking, feedback and the return of marks and feedback to students. For an introduction to EMA please see our supporting guide. Our guide on EMA systems and processes gives guidance for higher education institutions on improving business processes and choosing information systems to support assessment and feedback. Our enhancing assessment and feedback with technology for FE and skills guide shows how technology can add value to assessment and feedback processes and provides practical advice and guidance including a number of effective practice examples. For FE and skills, our guide assessment for learning: a tool for benchmarking your practice in FE and skills is a hands-on tool to help colleges and providers self-assess their assessment practices. Listen to our podcast to find out more about the benefits that institutions are achieving through the electronic management of assessment or read the full text transcript. Listen to our podcast to find out more about how institutions are making use of our assessment resources or read the full text transcript. If your role involves managing administrative processes or IT systems you may find that this is the most helpful route into the resources for you.